More than 32 million Americans wear contact lenses, according to the American Optometric Association, and at some point every one of them has had to learn to clean the lenses. Though "no-rub" solutions purport to clean your lenses overnight with no rubbing, some bacteria can form biofilms that are semiresistant to such solutions and can cause eye infection. 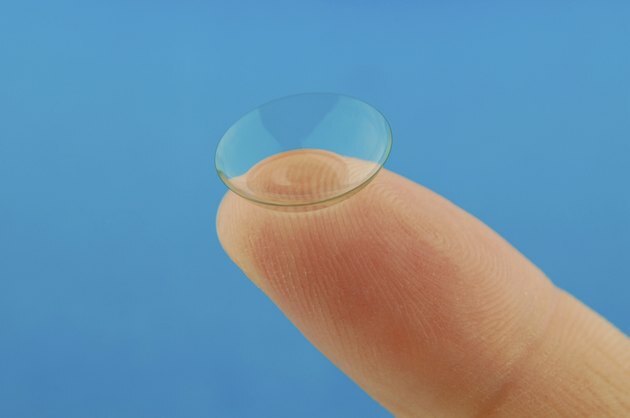 With just a couple of minutes of care daily, though, you can remove the deposits from your contact lenses. Gather your contact supplies -- a multipurpose solution and contact lens case. Some solutions already include ingredients to remove protein buildup, so check your solution label. There are also products that can be added to the solution made specifically for protein removal. Wash your hands. To remove lenses, you have to touch your eye. Dirt and germs on fingers open the door to irritation or infection. If you have pieces of dirt on your fingers and handle lenses, you could also scratch them. Fill both the left and right sides of your lens case with solution, adding a few drops of special protein remover if needed. The lens cups should be filled two-thirds full, enough to cover the entire lenses and prevent their edges from drying out. Remove one contact lens from your eye gently. If you squeeze too tightly, you could irritate your eye and possibly cause a tear in the lenses. Gently pull down the lower eye lid with your middle finger, and then with your thumb and index finger, grab the lens. Clean your lens. Different lenses require different cleaning methods. During most contact fittings, these instructions are explained by your optometrist. If you're not sure how to properly clean your lenses, contact the eye doctor who prescribed them. The standard cleaning method is to squeeze a bit of solution into your palm and gently slide the lens around in the solution with your other hand. Do this to both sides of each lens. Place cleaned lenses in corresponding sides of your contact case. If you took out the left lens, make sure to put in the case side labeled left, and the same for the right side. When you have the same prescription in both eyes, having a specific side for each cuts down on spreading infection from one eye to the other by cross-contamination. Close the lid tightly. A tight seal ensures nothing gets into the contact case, such as germs and dirt. It will also keep liquid from spilling out if the case gets bumped or tipped over. Repeat the removal, cleaning and storing steps for the second eye. According Bausch and Lomb, you should let lenses soak for at least four hours. This ensures your cleaner has time to take full effect.